War, defined as armed conflict between nations or between opposing factions within a nation, can have grave consequences for the environment, public health, and natural resources. The impact of military tactics and weaponry extends beyond military targets to affect civilian populations and their infrastructure, air and water; armed forces directly target forests, jungles, and other ecosystems in order to deprive enemy troops of cover, shelter, and food; mass refugee movements and other disruptions caused by armed conflict can deplete nearby sources of timber and wildlife; and the general atmosphere of lawlessness that often prevails during or after conflict can make it difficult to prevent illegal logging, mining, and poaching. Even peacetime military activities and preparation for war can be extraordinarily harmful to the environment. Although wartime environmental damage is as old as war itself, it is modern, industrial warfare that has raised the possibility of destruction on an ecosystem or global scale. From the use of poison gases in World War I and atomic bombs in World War II to the use of chemical defoliants in Vietnam and land mines in numerous internal conflicts, war now leaves a legacy that extends far beyond the battlefield and long past the duration of the original conflict. This problem has resulted in international treaties that attempt to constrain the adverse impacts of warfare on civilian populations and the environment. It also has ensured that environmental issues are closely monitored during wartime by the international community, in much the same way as humanitarian or refugee issues. 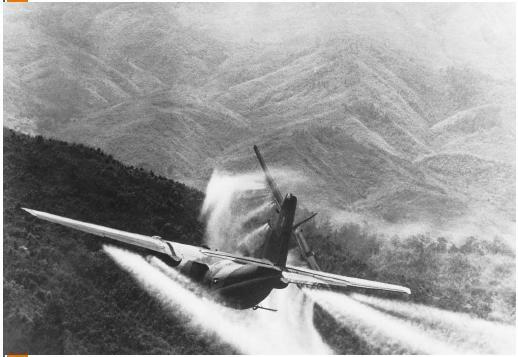 A U.S. Air Force jet spraying Agent Orange along the Cambodian border during the Vietnam War. Sherman's "March to the Sea" laid waste to large areas of the South, including civilian settlements and farms. In World War I, British forces deliberately set Romanian oilfields afire; in World War II, both Germany and the Soviet Union engaged in "scorched earth" tactics; and in the Korean War, the United States intentionally bombed North Korean dams to cause floods. Such tactics have always been controversial and led to periodic attempts to regulate them. The Old Testament (Deuteronomy 20:19–20) prohibits armies from cutting down fruit-bearing trees, and the Qur'an similarly commands against cutting trees or killing animals unless necessary for food. In 1863 the U.S. Army adopted the Lieber Code, which limited the actions of Union troops and was a precursor of modern military manuals. Since the twentieth century, international armed conflict has been governed by a series of treaties, the Geneva Conventions and the Hague Conventions , that have progressively restricted military tactics and weaponry, such as banning the targeting of civilian property or the use of poisonous gases. Occasionally, this body of law was directed toward environmental damage. For example, at the Nuremberg Trials, German General Alfred Jödl was found guilty of war crimes for his scorched earth tactics in occupied territory (although another general who used similar tactics, Lothar Rendulic, was found not guilty on the grounds that his actions were dictated by military necessity). However, the primary purpose of the international law of war remained humanitarian, aimed at eliminating inhumane weapons and reducing civilian casualties. ©Peter Turnley/Corbis. Reproduced by permission. ©Owen Franken/Corbis. Reproduced by permission. necessary to save American sailors from ambush, even though he acknowledged that it ultimately may have caused cancer in his own son, who was serving there at the time. U.S. veterans eventually were compensated for illnesses resulting from their exposure to Agent Orange, but proposals to compensate the Vietnamese victims have remained controversial. The defoliation campaign and other U.S. tactics in Vietnam led to an international movement for treaties that specifically protect the environment during wartime. This resulted in adoption of the Environmental Modification Convention (1976), which prohibits manipulating the environment as a weapon of war, and of Protocol Additional I to the Geneva Conventions (1977), which includes a prohibition against "widespread, long-term and severe damage to the natural environment." However, many critics have called these treaties vague and impractical, and in fact they have yet to be applied to a specific case of wartime environmental damage. The U.S. government signed both treaties, but has never formally ratified Protocol Additional I.
Wartime environmental damage again came to the fore during the 1990 to 1991 Persian Gulf War, in which Iraq invaded and occupied neighboring Kuwait. 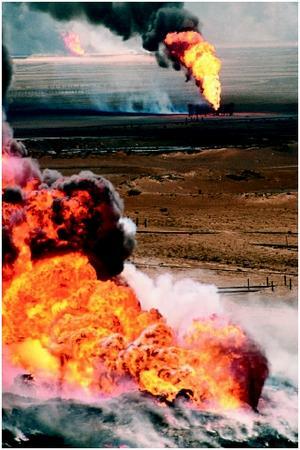 Driven from Kuwait by a U.S.–led military alliance, Iraqi troops deliberately ignited hundreds of Kuwaiti oil wells and diverted pipelines directly into the Persian Gulf. The resulting smoke plumes and oil slicks caused enormous harm to the Kuwaiti population and to desert and marine ecosystems and wildlife. Smoke from the oil fires was reported as far away as the Himalayas and was visible from space. As images of the devastation circulated around the globe, the United Nations Security Council passed Resolution 687, which held Iraq liable for all damage, including environmental damage, resulting from the occupation and liberation of Kuwait. This unprecedented action resulted in the establishment of a special commission, the United Nations Compensation Commission, to verify damage claims and issue awards. Kuwait and other Gulf countries filed more than sixty billion dollars in environmental, natural resource, and public health claims against Iraq, which a decade later were still being resolved. The extraordinary nature of the Security Council's action led to renewed calls for an international treaty or institution to regulate the environmental impacts of armed conflict. Subsequently, prohibitions against environmental damage were included in the charter for the International Criminal Court, a new tribunal that will have global jurisdiction over war crimes. Note: this map is a representation of herbicide spray missions in Vietnam. The dark areas represent concentrated spraying areas. This map only represents fixed-wing aircraft spraying, and does not include helicopter spraying of perimiters, or other spray methods. 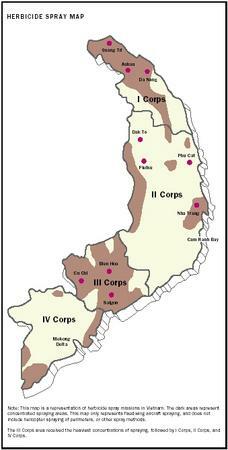 The III Corps area received the heaviest concnetrations of spraying, followed by I Corps, II Corps, and IV Corps. populations, such conflicts have considerable environmental impacts: Opposing armies engage in deforestation and defoliation, hunt wildlife for food, lay thousands of antipersonnel land mines, and clash over valuable natural resources (such as timber and diamonds) to finance their arms purchases. Because sovereign nations generally control their own affairs, it has been very difficult for the international community to address internal conflicts and their human and environmental consequences. Most international treaties governing wartime environmental damage do not apply to internal conflict, and even where they do, they are difficult to apply to loosely organized guerilla forces. Armed intervention or peacekeeping missions can solve some humanitarian and environmental problems while creating others. For example, the 1999 NATO bombing of Kosovo ignited a petrochemical plant in the city of Pancevo, exposing thousands of civilians to a cloud of toxic fumes; during the Rwandan civil war, United Nations refugee camps stressed natural resources and wildlife reserves in neighboring Congo. Another attempted solution has been global consumer boycotts of tropical timber, diamonds, and other commodities that originate in war-torn countries and give rise to or finance armed conflict. Military activities and preparations for war can have enormous environmental impacts even without a shot being fired. The development of the atomic bomb during the early 1940s, referred to as the Manhattan Project, not only had devastating consequences in Hiroshima and Nagasaki, but also produced a long-lasting legacy of deadly radioactive pollution in the United States. In 1939 Nobel Prize physicist Niels Bohr warned that although it was possible for the United States to build an atom bomb, it could not be done without "turning the country into a gigantic factory." Following the end of the Cold War in 1991, it became apparent to what extent that factory had contaminated such diverse sites as Hanford, Washington; Oak Ridge, Tennessee; and Rocky Flats, Colorado; where the air, groundwater, surface water, soil, vegetation, and wildlife all show signs of radioactivity. The Soviet Union's nuclear program created similar problems, concentrating production in "secret cities" such as Chelyabinsk-7, which many have called the most polluted city on earth. Given the highly toxic nature and extremely long half-life of most radioactive waste, cleanup and containment of these sites will pose problems for generations. The Cold War legacy brings into focus the "necessity" and "proportionality" calculations that underlie most reasoned decisions about environmentally damaging wartime actions: whether there are alternatives to taking a particular action, and whether the military advantage gained from taking such an action outweighs the environmental and other harm that potentially may result. Most scholars would agree that the development of the atomic bomb was justifiable as a means of defeating fascism and winning World War II; they similarly agree that Iraq's actions in retreating from Kuwait were indefensible, even on military grounds. Other cases, such as the United States' defoliation campaign in Vietnam or bombing of civilian infrastructure in Kosovo, are more controversial. In any case, the historical record, the continued development of international treaties and institutions, and the increasing awareness that environmental issues must be considered even during wartime, all should provide a basis for improved military tactics and more environmentally aware decision making in the future. SEE ALSO T ERRORISM . Austin, Jay E., and Bruch, Carl, eds. (2000). The Environmental Consequences of War: Legal, Economic, and Scientific Perspectives. Cambridge, UK: Cambridge University Press. Bloom, Saul; Miller, John M.; Warner, James; and Winkler, Philippa, eds. (1994). Hidden Casualties: The Environmental, Health and Political Consequences of the Persian Gulf War. Berkeley, CA: North Atlantic Books. Browne, Malcolm W. (1991). "War and the Environment." Audubon 93:89. Dycus, Stephen. (1996). National Defense and the Environment. Hanover, NH: University Press of New England. Earle, Sylvia A. (1992). "Persian Gulf Pollution: Assessing the Damage One Year Later." National Geographic 181:122. Feshbach, Murray, and Friendly, Albert. (1992). Ecocide in the U.S.S.R.: The Looming Disaster in Soviet Health & Environment. New York: Basic Books. Lanier-Graham, Susan. (1993). The Ecology of War: Environmental Impacts of Weaponry and Warfare. New York: Walker & Co.
Levy, Barry S., and Sidel, Victor W., eds. (1997). War and Public Health. New York: Oxford University Press. Rhodes, Richard. (1986). The Making of the Atomic Bomb. New York: Simon & Schuster. Roberts, Guy B. (1991). "Military Victory, Ecological Defeat." 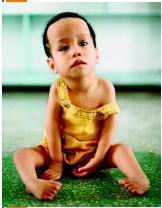 In Worldwatch , July/Aug. 1991. Webster, Donovan. (1996). Aftermath: The Landscape of War. New York: Pantheon. Weinberg, William J. (1992). War on the Land: Ecology and Politics in Central America. London: Zed Press. Zumwalt, Elmo Jr.; Zumwalt, Elmo III; and Pekkanen, John. (1986). My Father, My Son. New York: Macmillan. Environmental Change and Security Project. "Bibliographic Guide to the Literature." Available from http://wwics.si.edu/PROGRAMS . Environmental Law Institute. (1998). "Addressing Environmental Consequences of War: Background Paper for the First International Conference on Addressing Environmental Consequences of War: Legal, Economic, and Scientific Perspectives." Washington, D.C.: Environmental Law Institute. Available from http://www.eli.org/pdf . Environmental Law Institute. (1998). "Annotated Bibliography: First International Conference on Addressing Environmental Consequences of War: Legal, Economic, and Scientific Perspectives." Washington, D.C.: Environmental Law Institute. Available from http://www.eli.org/pdf . Hoffman, Leslie. "Saving the Ghost Ship." Albuquerque Tribune , July 31, 1998. Available from http://www.abqtrib.com/arc1 . United Nations Environment Programme. (1999). "The Kosovo Conflict: Consequences for the Environment & Human Settlements." Geneva: United Nations Environment Programme. Available from http://www.grid.unep.ch/btf . The pollution associated with military preparedness is substantial, ranging from the effects of housing, feeding, supplying, and moving large bodies of people, to the impacts of weapons practice and war games. The closure, under protest, of the U.S. Navy's live-fire bombing and artillery ranges on Vieques Island off the coast of Puerto Rico will require the cleanup of nearly sixty years of accumulation of bomb fragments, unexploded ordinance, waste munitions, and landfills. The Navy is conducting an environmental investigation under a consent order signed with the U.S. Environmental Protection Agency. The Comprehensive Environmental Response, Compensation, and Liability Act, or Superfund, requires the military to clean up hazardous waste on its bases. In particular, this is required at bases being closed. The scope and cost of these cleanups are staggering, even for the Department of Defense. A RAND research study of the closure of six California bases recommended setting interim cleanup goals, concluding that "cleanup too long delayed—in the interest of fulfilling a total cleanup program—is cleanup never realized." Ever since the U.S.S. Arizona sank in Pearl Harbor on December 7, 1941, a slow trickle of fuel oil has seeped toward the surface, casting a rainbow sheen on the now-still waters. The Arizona had 1.5 million gallons of oil in its tanks when it was attacked, and it is unknown how much remains. Although the current 2.5-gallon-per-day leak does not present much of an environmental hazard, the caretakers of what is now the Pearl Harbor National Monument have made plans to minimize impacts if the Arizona's hull collapses and releases the remainder into the harbor's fragile marine ecosystem.